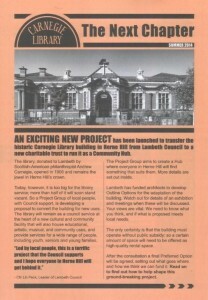 The Project’s aim is to create a community building where everyone in Herne Hill will find something that suits them. The website has full information including project documents, how to subscribe for Project news, and how to get in touch. Over the coming week the Project is also distributing around 10,000 copies of its newsletter to residents of Herne Hill, in both Lambeth and Southwark. Look out for your copy. It’s a bright ‘terracotta’ colour – you can’t miss it. Do visit the website, read the newsletter and put in your views. Help write The Next Chapter for the Carnegie.